In December, 1955, after a long day at work as a seamstress at a Montgomery, Alabama department store, Rosa Parks got on her bus and plunked down in a first-row seat of the section clearly defined as Blacks Only. "The back of the bus". The unwritten, unofficial public transportation rule in Montgomery said no white person should be standing in the aisle if a black person has a seat to give up to them. Four white men got on the bus but the white section was full. The four blacks in the first row of the black section were told to get up and give up their seats. Three of the four moved. Parks sat and waited. She was arrested and fingerprinted on the day which would mark the end of what might have been for her a quiet, uneventful life. It was the impetus for the Montgomery bus boycott, an effort that would last just over a year before the U. S Supreme Court struck down the laws on transportation segregation. 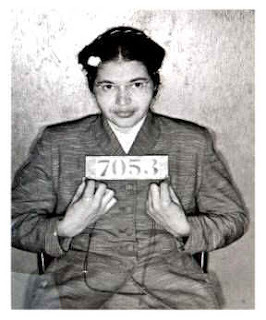 She wasn't the first one to have refused to give up a seat on a Montgomery bus (the civil rights movement was already well under way) but black leaders, including a young, untested Martin Luther King, wanted an issue in Montgomery and Rosa Parks was perfect in the role of innocent provocateur. She was far from being apolitical, however. At the time of her arrest, she was the secretary of the Montgomery NAACP and was working with other groups to engage in passive resistance to the Jim Crow laws of her state. Her actions brought unwelcome public attention to Montgomery in the form of that year-long bus boycott. The days of segregated buses, schools, lunch counters, restrooms, and drinking fountains were numbered, though it would take a few more ugly years before certain thick-headed whites got the message. It was one of those iconic events that registers and resonates until both the event and the person triggering it become larger than life. She became Rosa Parks, the embodiment of passive civil disobedience, and continued as an activist throughout her life, until a series of illnesses brought her work to a halt. Before she died at age 92, she co-founded The Rosa and Raymond Parks Institute for Self Development in Detroit, the city where she was living when she died, "to motivate and direct youth not targeted by other programs to achieve their highest potential". Her will specifically left the bulk of her estate to the institute -- some $372,000 plus what had once been described as over 10 million dollars worth of memorabilia. 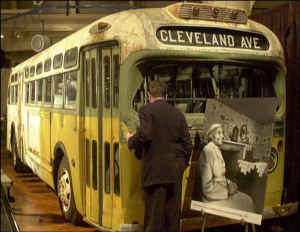 Last week the Detroit Free Press front page headline read: "Rosa Parks' estate was drained. Cash Gone, memorabilia is in limbo." Parks died in October, 2005. By November her relatives were petitioning the court to overturn the will that left them with just dregs and neglected to give them control over the estate. By the time it was over, lawyers' fees had eaten up most of the cash, and the Institute she so loved was no longer in control of the funds or the memorabilia. In exchange for confirming the validity of Parks' will and trust, [Steven Cohen, lawyer for co-founder Elaine Steele and the institute] said, the institute agreed to give the relatives a part of the royalties it received from licensing Parks' likeness and image. Parks had assigned those rights to the institute in a 2000 agreement that wasn't part of her estate. Cohen said the institute reluctantly agreed to sell or license its memorabilia collection to a museum or historical institute and give some of the proceeds to the relatives. Though the settlement agreement called for [court-appointed family attorneys, John Chase Jr. and Melvin Jefferson Jr.] to bow out of the proceedings, Cohen said the pair refused to leave and kept billing the estate for fees. Worse, Cohen said, the pair falsely accused him of divulging details of the confidential settlement agreement during a 2009 Michigan Court of Appeals hearing where the institute unsuccessfully challenged Chase and Jefferson's request for $105,000 in fees. Even though they weren't parties to the settlement agreement and had no legal standing to do so, Cohen said Chase and Jefferson asked [Wayne County Probate Judge Freddie Burton Jr.] to order the institute and Steele to forfeit Parks' estate assets, including the memorabilia collection. He said Burton agreed, even though confidentiality disputes were to be submitted to binding arbitration, not Burton, per the settlement agreement. Moreover, Cohen said Burton never allowed the institute to present witnesses, documents or defend itself at a trial before taking the institute's property. Cohen said Chase and Jefferson never specifically identified what Cohen supposedly disclosed or who heard it. In early 2010, Cohen said, Burton approved a verbal request that the institute and Steele pay Chase and Jefferson $120,075 for an unexplained claim for fees. Cohen said no trial was ever held. If I'm reading this right, not a single request by Rosa Parks was honored by her family. A couple of judges and a couple of lawyers appear to have colluded to give the family what Rosa Parks herself didn't want them to have. There's a reason she wanted her estate to go to an institute helping young people realize their potential. It should be clear to anyone who has ever heard of her. It's because she was Rosa Parks and it was her legacy. Now the funds are gone and her huge, important memorabilia collection is up for auction at Guernsey's Auctioneers in NY. If it goes well, the entire collection will stay together and intact at a museum somewhere. But if Ms. Parks wanted it to stay in Detroit at the Rosa and Raymond Parks Institute for Self-Development, her own baby, that's where it should be. Seems pretty straightforward to me. I could have solved this problem pro bono by simply saying, "Here's the will, there's the door". But of course nobody asked me.